LA Thoma is an online influencer who has taken advantage of the social media space to promote her beliefs and interests. Though she is professionally known as a physical therapist, Thoma is more successful on the internet. She is famed as an Instagram star and also as the better half of a Hollywood actor. Let’s explore interesting facts about the blonde beauty. LA Thoma Biography – Who Is She? Andrea LA Thoma is a native of Ohio born on July 11, 1988. There is a dearth of information about her early life and elementary education. But a search into LA Thoma’s family background revealed that she is biracial with Asian roots. She studied exercise physiology at Kent State University and graduated in the year 2009. She further obtained a doctorate degree in physical therapy from Old Dominion University. LA Thoma began practicing her career while still in college. During her undergraduate days, she interned as a physical therapist in different areas including Virginia and Connecticut. Thoma is professionally a physical therapist, but she is better known as a social media influencer with a massive following on Instagram. More recently, she is also recognized as actor Grant Gustin’s wife. Andrea LA Thoma is one of the four children born to James and Judy Thoma. Her parents and siblings Jonathan, Louise and Christian are all Ohio based. Andrea is not the only one doing well in her family. Her older brother Jonathan Thoma is a business developer at Hyperion Motors and also a resort sale staff at Marriott Hotels. As earlier mentioned, Grant Gustin is the man in Andrea LA Thoma’s life. While there is inadequate information regarding how and where they met, the couple is believed to have dated for about a year before stepping their romance up a notch. Gustin and Thoma who got engaged in April 2017, tied the knot more than a year later in December 2018. The Flash actor and physical therapist wedded in a beautiful and private ceremony attended by family and close friends at Valentine DTLA. Unsurprisingly, their guest list included some of the actor’s colleagues. LA Thoma and Gustin are apparently head over heels in love and their fans can only wish them a forever ending and a lifetime of love and happiness. Before they wedded, LA Thoma once revealed that she thought Gustin was joking when he proposed. The Flash actor popped the question with a large round-cut diamond ring following an impromptu decision. Afraid that his fiancee was already aware of his engagement plans, Gustin proposed at a random moment which made La Thoma think he was joking. The physical therapist first scared her future husband with a good laugh before eventually saying ‘YES’ and today, the rest is history. Shortly after their engagement and about a year before they officially tied the knot, false reports emerged that LA Thoma and Gustin had secretly wedded in Malaysia. But Gustin promptly dismissed the rumors which stemmed from an ancestral ceremony the couple had in accordance with traditional Kadazan customs. La Thoma’s mother is a Kadazan and a native of Borneo Island. 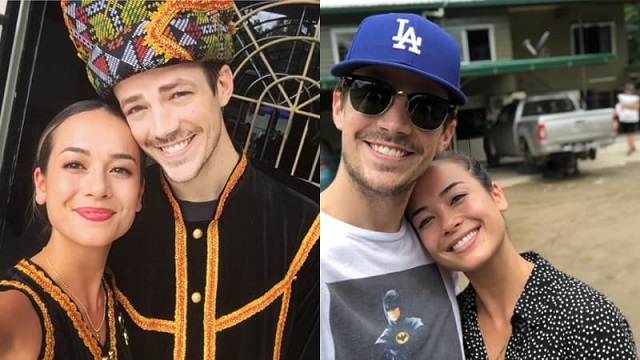 So to honor her maternal roots, Andrea and Gustin dressed traditionally for the ceremony and received spiritual blessings from a medicine-man and a shaman. Though the couple did not sign any document at the customary event, they, however, admitted that they already felt technically and spiritually married at the time. See Also: Asmr Darling Biography, Net Worth How Old Is She, Who Is Her Boyfriend? The exact figure of Thoma’s earnings and net worth from her various endeavors is unknown. However, she is believed to be earning a decent amount which can afford her a comfortable lifestyle. Other than the apparent physical attributes such as her blonde hair and brown eyes, LA Thoma’s height, weight and body measurements have not been made public knowledge. It is no news that Andrea LA Thoma is very active on social media. She has a large community of fans on popular platforms including Instagram and Twitter. Though she is professionally a physical therapist, Thoma seems to be more successful on the internet. A fitness enthusiast, she often shares videos of her work out with fans on Instagram. Andrea is famed for her signature hashtag #daretobeactive and has over half a million followers on the site. Thoma is of mixed ethnicity with Kadazan and Malaysian roots. The Instagram star and physical therapist who wears her heritage with pride, speaks fluent English as well as basic Kadazan language and Malay language.